What we’re doing to the bathrooms. Hopefully. Someday. We did it. We got it installed. 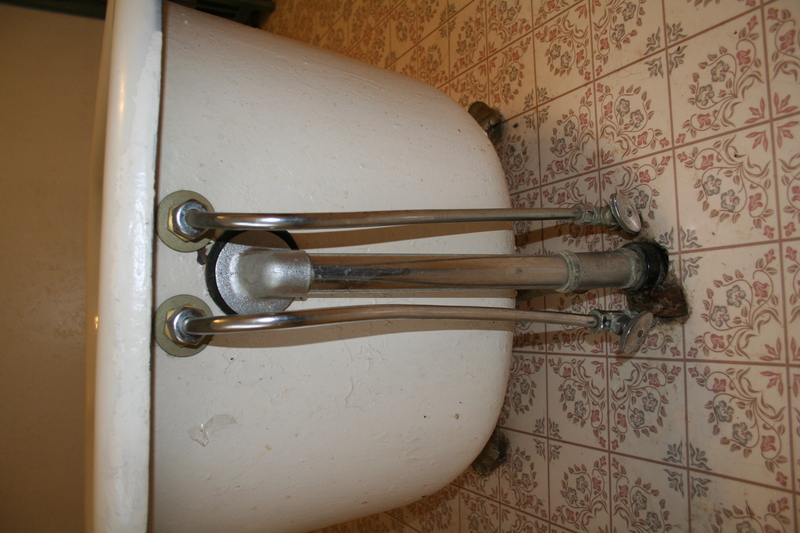 I have always read these types of handles as BUT rather than TUB. More photos someday, maybe when we figure out what color we actually want for the walls. Small improvements — that’s all we can hope to make over a weekend (or two). The old faucet and drain (hell) hole. So I went out and bought a cheap faucet. 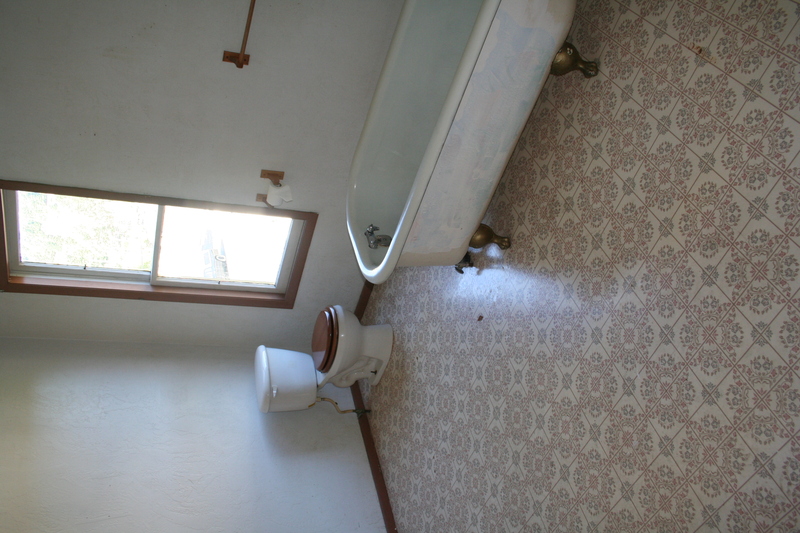 I know it’s not a good idea to buy cheap plumbing fixtures, but… I’ll leave it at that. The first thing you need is to make sure you have tools. Not just any tools, but the right tools. And maybe some help. According to the enclosed instructions, the average estimated time for installing this lavatory faucet is 60 minutes. This does not include the time to remove the old faucet. “This estimated time will vary depending on many variables such as the install application, the skill level of the installer, the type of plumbing, the type of tools used, etc.” Considering my skill level was nil, the types of tools were questionable (“honey, do we have a really big wrench for removing the drain?”), and because of my special helper, I expected this project to take at least 360 minutes. We spent a lot of time not getting things done. And it just might have. The new faucet (and drainstopper!). I drew a diagram. You see, I might be good with words here, but put me in front of a stranger, or even a friend, anyone that is not related to me by blood or marriage, and I start to sweat, my heart starts pounding, I make too many jokes, and my point is far lost. We will be ordering fixtures for our bathtub soon, so I am posting this diagram here to show to the plumbing folks (hi plumbing folks!). 1) The bathtub is far from the walls (side of tub is approx 20 inches from wall). The faucets are in the center of the room. We will not be able to attach the riser to the wall. The riser must be attached to the shower ring, which needs to be supported by ceiling supports only. We're not turning it around. 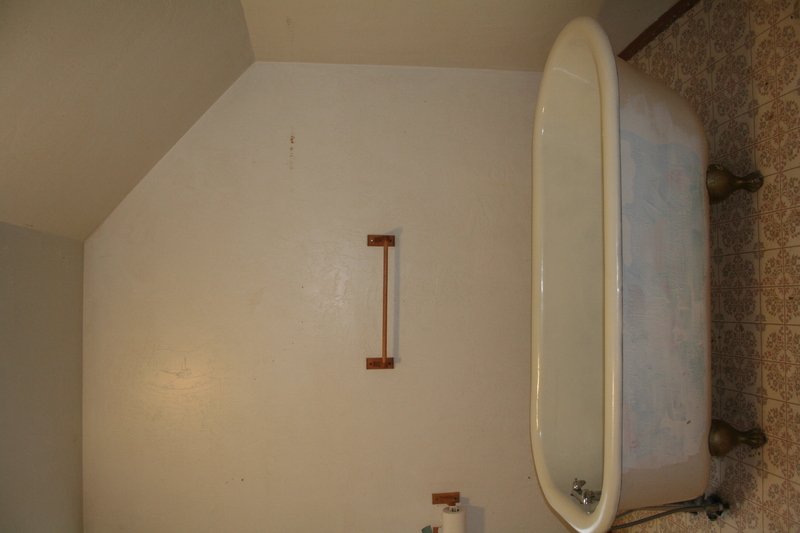 2) The room has a sloped ceiling on the other side of the tub (non-faucet side). 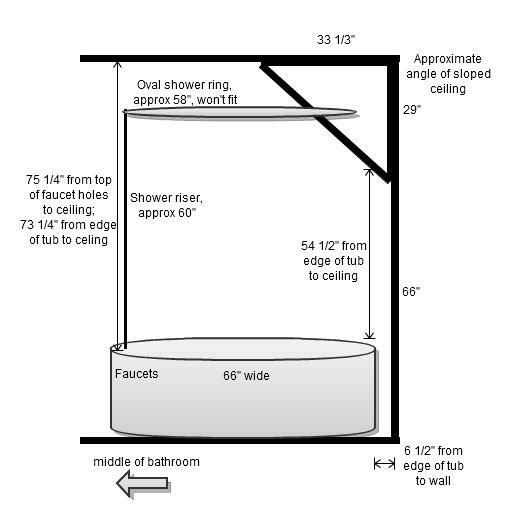 The angle of the ceiling is such that a 58″ oval shower ring will not fit at 60″ high. We don’t particularly want a round shower ring because we think it would feel too small — can the oval rings be cut to a custom size? 3) Do you think we need new waste, overflow, or supply lines? Our supply lines bring hot water to the right faucet and cold water to the left faucet. We can switch the handles, right? Will our children be forever damaged by reversed handles? Our gorgeous supply lines. Note the block of wood wedged between the pipes presumably to prevent rattling. Old school. Updated March 19 to add this photo of the faucets and drain. 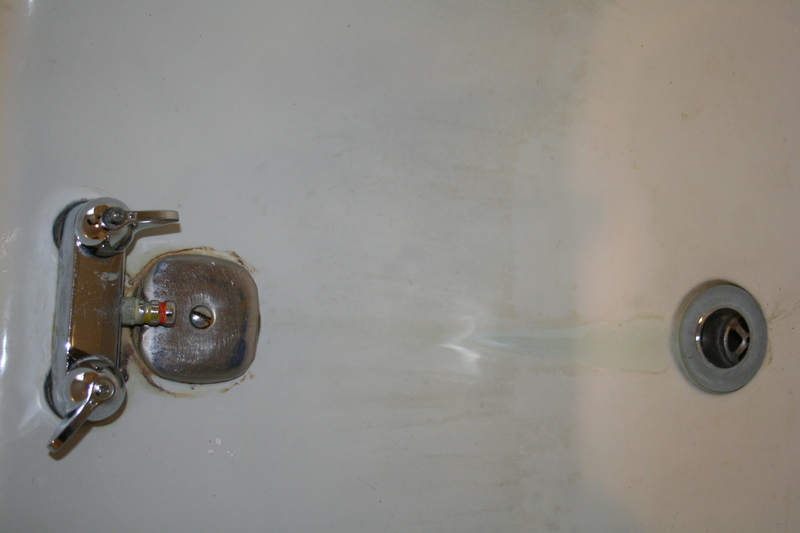 Our current faucet situation. It's noisy, but makes an awesome bubble bath. I don’t know what to say. There are a bazillion things we could do with this space, but we … we are tired. We’ve lost inspiration. We’ve lost the will to pick out a paint color, to dream about toilet seats, to figure out what furniture we can put in here to store our towels and sundries. Now, at least, there are many advantages. Kesey no longer poops or pees in the rest of the house. This means we are no longer racing Booker to see who can pick up the poop first (us with toilet paper in one hand and Clorox wipe in the other; Booker with his mouth at the ready), and we are no longer nervous when we leave an article of clothing (or a backpack, or a pile of shoes) on the floor. Kesey’s anxiety-caused vomiting is rare. Booker can’t chase the weak and tired clawless cat, and Zeppo, king of all cats (in his mind), no longer picks on the old man. The best of all is that Kesey comes to us full of crazy purrs whenever we need to go pee.